A good, at times gripping, story featuring the famous detective and the first (brief) mentions of Moriarty, his arch-enemy. 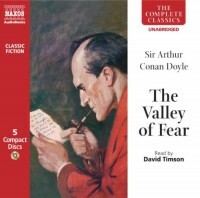 As with most of Arthur Conan Doyle's Holmes stories, I was disappointed by what I feel is a certain blankness (characters and locations often not adequately described, and a general pulp fiction sort of vibe). However, some of this impression could be a product of my own ignorance of the language and history of the Victorian times in which the stories were set — while reading them, I often wish I had had the opportunity to take part in some immersive Victorian 'event' as part of my education. There is actually a yearly Dickens festival in a town not far from me where much of the town is said to get in dress and character, so maybe that's something I should try. On the other hand, it might be the twee-est festival in southern England. I enjoyed the first half of the book more than the second, and there were plenty of quotable paragraphs sprinkled throughout, signifying that, while this isn't literature, it's at least intelligent writing worth reading.